God will supply all your needs according to His riches in glory, – in Christ Jesus. Oh what marvellous scriptures.”All Things !” “ALL Things ! ! ” “ALL THINGS ! ! !” This superlative little phrase “all things” recurs in Scripture. It is not one thing or some things or many things or most things. He gives us ALL things and it is done for us to richly enjoy. And lest we missed the first and second mention of “ALL” He sprinkles that little word throughout Scripture – in so many precious promises. What special reassurance this is to you as it is to me! What satisfying assurance He bestows on us in these – “All Things.” What wonderful confidence He confers on us in these – “All Things.” What a great guarantee He gives Us with His remarkable – “All THINGS !” Nothing is overlooked and nothing is excluded in the Father provision for His children. Therefore as His children we shall want for nothing. God’s pledge to provide all.. and touches all temporal as well as spiritual things. His assurance is first to provide all physical and bodily needs.. and too many of us look at the overwhelming circumstances in our teetering lives. Too many of us become anxious as the ominous future looms ahead. We have just enough for today but tomorrows’ advancing shadows haunts us, and we become troubled in our hearts and sick in our soul – lest tomorrows bowl of meal becomes empty – and tomorrows cruise of oil runs dry. But He tells us if we seek Him and His kingdom and live righteously before Him.. He will supply all things needful and all essential things will be added to us. He will better provide for His children than for lilies and sparrows! He will ensure the daily necessities of life will be added and poured into our lap. 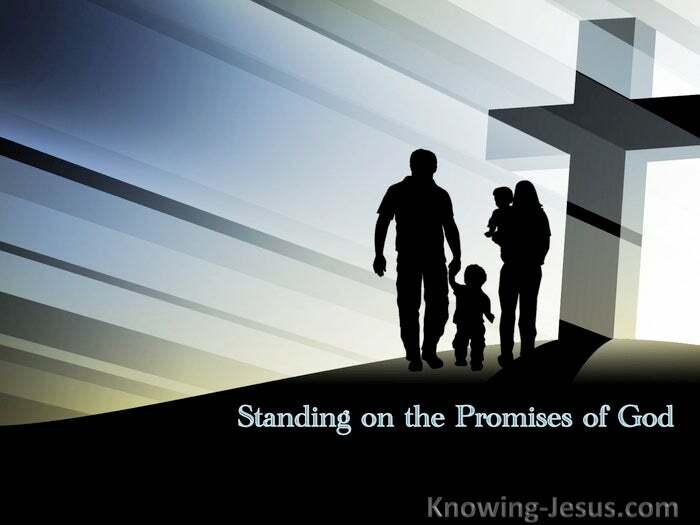 If God’s promises are sure then no circumstances can displace His assurances. If God’s Word is true, then no action or governmental law can overthrow His oath. His proof and guarantee that His Word and promises provision is sure.. is the gift of His Beloved Son in Whom He is well pleased – so that we can be made adoptive sons, whom He also loves and loves so dearly! If so great a gift is forthcoming from the Father, He will not withhold the smaller gifts that are needed for our daily survival. Ours is not to worry, but to trust in His loving provision. His is to carry out His never-failing promises and His vow to you. Whether we have a little or a lot – He will provide enough. Only be thou strong and very courageous..
For I have commanded thee. Nothing can prevent our Lord from carrying out His plans and purposes. Our living Lord has jurisdiction and sway over both men and nations. It is His power and authority that governs both times and tides. It is our Father Who rules and regulates the days, the seasons and the harvests. It is He Who has supremacy over the spinning globe and the mighty universe. Shall He not so much more care for you.. who are His blood bought possession? But is it possible to trust Him in ALL things to provide ALL things? Well, I wonder if you have been placed in a position where you entrusted your three young children to a steward on a four hour sea journey with a promise to them, that on their return they would be taken to their new home and yet in your trembling heart you knew only too well that no such place existed? I have. And as I turned to face the stark reality that I had five days to achieve this… less than a week to fulfil this enormous task. I searched for vacancies in basements and attics. I searched for a tiny crumb of comfort. I searched for a place to rest the heads of my children – now on holiday with grandparents in England. Christ had nowhere to place His head and maybe in a way I began to understand just a fraction of what that meant. But would I have to follow in His poverty-stricken footsteps even here – as each ‘pushed-on’ door continued to be slammed in my face. My faith was weak and my heart was crying and my courage was far from valiant! And encouraging phone calls came from my mother – that “He would provide…” Inspiring support from one who had also trodden this homeless way before me. Yet I almost despaired that God’s promise included me as well. But as I searched amidst an almost empty vacancy list.. Each tiny apartment was withdrawn from my grasp and the search continued. And yet years before God had gone ahead and selected my future abode.. a veritable’ palatial place – indeed a palace! And as I came to the extremity of my need.. so He provided the “all” that I needed – pressed down and running over. Our God is a God of surprises – Who never mirrors His miracle or provision. Sometimes He feeds through manna and sometimes via the ravens. Sometimes He provides the meal that does not diminish and the oil that doesn’t run dry. Sometimes He causes the axe-head to swim or the rock to gush water. Sometimes He speaks through a donkey or by means of the rustling in the treetops. Sometimes it’s the touch on the hem of His garment, or a dip in a river. Sometimes He divides the waters and other times sends the angel of death.. but always He provides all things needful. Sometimes He provide a Cave of Adullum. Sometimes He provides a stable, with a feeding trough and an armful of hay. But each time He provides, we discover Him to be a God of surprises – and each time He provides – is just one more confirmation that His Word is true. Remember, my miracle is for me – but He has His miracle for you. I have been young, and now am old; yet I have not seen the righteous forsaken, nor his descendants begging bread. Psa.37:25. He will not fail nor forsake you. Heb.13:5. He that has kept Israel together as a nation for 2000 years.. will He surely provide all the needs, for each beloved child of God according to His riches in glory? For God is able to make all grace abound to you, so that having all sufficiency in all things at all times, you may abound in every good work. 2 Corinthians 9 – God will supply all your needs according to His riches in glory, in Christ Jesus.. Phil.4:19. So seek first His kingdom and His righteousness and all these things will be added unto you.. Matt.6:33 These are just some of the ALL-embracing promises of God – to you.